Of Wiarton, peacefully at Gateway Haven, Wiarton on Tuesday, July 2, 2013. 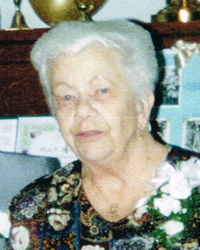 The former Maria "Mary" Prinsen at the age of 91 years. Loving wife of the late James "Jim" Swift. Sister-in-law of Patricia Alden Karn, of Tillsonburg, Alison (Grant Watson), of Windsor Mills, Quebec, and John Swift (Joan), of Wingham. Sadly missed by her nieces and nephews. Predeceased by her parents Archibald and Jenny; sister Anneken Prinsen; sister-in-law Eileen Wiley; and brothers-in-law Arnold Alden, Clarence Wiley, and Willard Karn. Friends may call at the Thomas C. Whitcroft Peninsula Chapel, 272 Berford St., Wiarton on Wednesday, July 17, 2013 at 2 pm to celebrate Mary's life. Visiting one hour prior to service. Cremation has taken place. Donations to the Heart and Stroke Foundation would be appreciated.